Els Viaene (°1979, Belgium) started her work as a sound artist / field recordist in 2001. With a set-up of two small microphones she listens, zooms into and enlarges the aural landscapes surrounding us. The natural rhythms and textures of the sounds hidden in those landscapes form the basis of her work. Working on these sound materials for performances, sound compositions or installations she makes the listeners travel in imaginary and organic environments. Through the specific use and set-up of sound within a space her installations create new spaces within existing ones, either emphasizing or making dissapear the physical borders of that space. In doing so she often plays with the notions of seeing and hearing, the perception of what we see and hear and how both interfere. A point in time (BE) - performance, Oscillations Festival, Brussels. Vibrant Matter (FR) - sound installation, part of Interstice Festival, Caen. Aural Landscape (FR) - solo exhibition, Bon Accueil, Rennes. A point in time (AT) - performance, Alte Schmiede and Kunstradio, Vienna. A point in time (NL) - performance, part of seminar, Social Cultural Studies, Tilburg. Sound as vibration - Individual Grant by the Flemish Government, two year period. Vibrant Matter (CA) - sound installation, part of exhibition MoisMulti, Québec, Canada. Vibrant Matter (FR) - sound installation, group exhibition Anis Gras, Paris, France. Vibrant Matter (D) - sound installation, group exhibition Lab30, Augsburg, Germany. Vorig jaar in Gdansk (BE) - group exhibition and publication in curation of Oscar Van den Boogaard. Canopy Beat_Soundtrack of the Rainforest (BE) – two channel set-up in a black box as part of Bozar Night Brasil. Drawing Of a Landscape_Sahara Lommel (BE) – site-specific composition on the region of the Sahara in Lommel. Le Temps Immobile (BE) – sound performance at Field Fest. Set-up of 5 speakers in the spaces surrounding the performance space. Follow Me Inside Out (DK) – composition for cello and live-processing – commissioned by Spor festival / performed with Claire Goldfarb. Courent d'Air (BE) – sound installation and performance together with François Martig during Q-O2 residency. Vibrant Particles (BE/ES) – live performance on podcast for Arteleku Audiolab – created together with Yves De Mey. Canopy Beat_Soundtrack of the Rainforest (BE) – 30 min. composition based on field recordings in the Brazilian Amazon forest. Into the light of the night (UK) – collaboration with Dan Belasco Rogers and Sophia New for GPS guided audiowalk in Kortrijk. Hori (AU) – sound composition released on the Australian label Recorded Fields, compilation Three Locations. Live-In-Room (BE) – installation/performance together with Lilia Mestre. Women (BE) – creation of a soundtrack for a film made by Annemie Maes. Sense Radio (BE) – research project together with Lilia Mestre. The Glasshouse (BE) – creation of an installation/performance for the Happy New Ears Festival together with François Martig. Politics Of Change (BE) – sound compostion created for a video installation made by Annemie Maes. Sound/Space/Relation (BE) – workshop at Art Performance Training Antwerp together with Lilia Mestre. 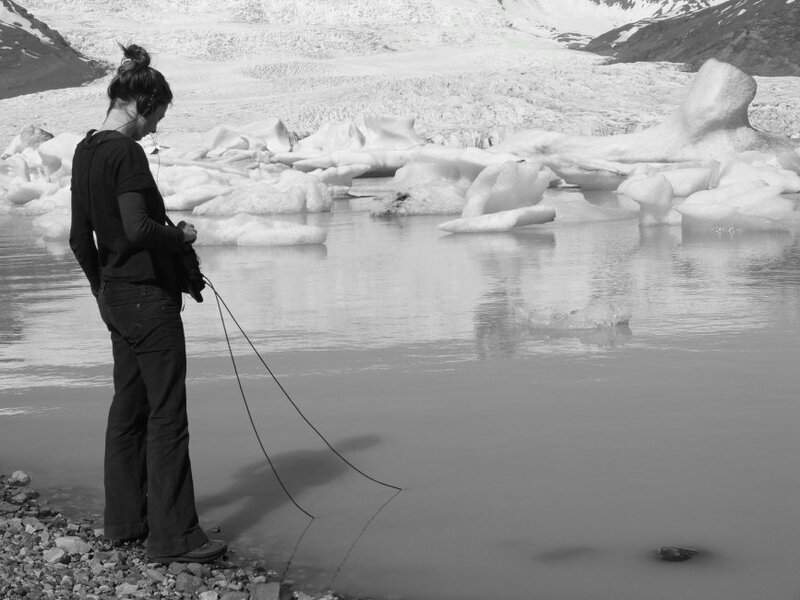 Dissonant (BE) – sound recording and editing for 16mm filmwork by Manon De Boer. Suite Spiration (BE) – sound recording of a string quintet and sound edit and mix for art video made by Yves Coussement. Borges (BE) – voice recording and soundscape about the poet Borges, in collaboration with Toyfoo and Passa Porta. What’s in a name (BE) – performance at Kunstencentrum Netwerk Aalst, live processing and piano, in collaboration with Johan Hoogewijs.